Gyronix | Turning Ideas into Action! Gyronix products are now distributed, developed & supported by Olympic Limited! 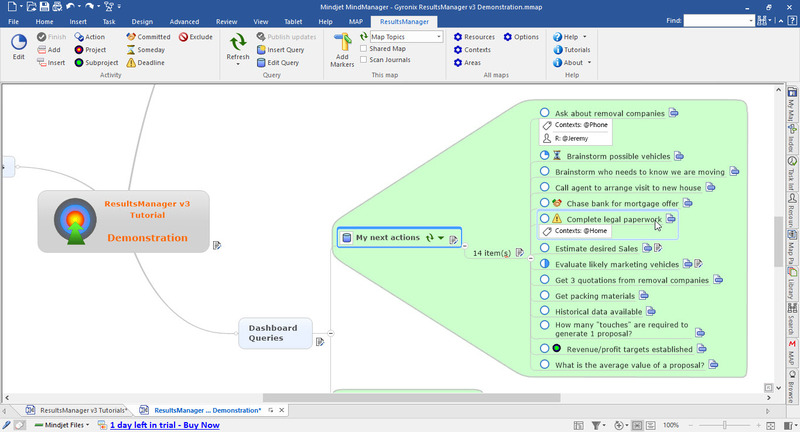 Professional solutions built for Mindjet® MindManager® that quickly and efficiently capture team brainstorming, build plans, assign tasks and timelines and keep track of detailed activities – all within an intuitive graphical interface that makes even the most complex of concepts simple to manage. Gyronix ResultsManager v3 runs on Mindjet’s MindManager 2016, MindManager 15, MindManager 14, Mindjet 11 and MindManager 2012 platforms, and delivers a systematic solution for visualizing and tracking actions either individually or across teams. A version of ResultsManager v3 is now available for users of MindManager 2017 and can be obtained from Olympic. MindManager 2017 version available now! Gyronix GyroQ™ for Mindjet® MindManager® quickly captures random ideas and fleeting thoughts and puts them in a queue. Later on, when you are ready to deal with them properly, you send the queue to MindManager® for Windows, and develop your ideas there. GyroQ is currently supported on MindManager versions MindManager 2017, MindManager 2016, MindManager 15, MindManager 14, Mindjet 11 & MindManager 2012. You can download current versions of ResultsManager and GyroQ from Olympics’ download area by clicking the button below. If you are looking for earlier versions of Gyronix products then please contact Olympic through their contact page and let them know the product you require and they will do their best to make sure your requirements are met. Gyronix products and solutions are now provided exclusively through Olympic. Single and multiple user licenses are available as well as upgrades and special license plans for Education, Non-profit and Corporate entities. Click the button below to purchase online through Olympic. Many corporations now recognize that the total cost of ownership includes the learning curve needed to achieve effective use of new software tools and integrate them into daily productivity. It is better to use a smaller number of tools and systems well, rather than to make only limited use of a larger set.